The launching of this year's Sun Valley Artist Series is a bittersweet one for Artistic Director Susan Spelius Dunning. The pianist who considers her music "my ministry" will be able to perform with some amazing talent and provide four solid classical music concerts starting with one for the holidays and ending with one that honors the memory of a young man whose life was cut short by suicide. Dex Gannon is the son of Dunning's fiancé and the organization's executive director, Steve Gannon. The 21-year-old was found on a frozen hillside above Elkhorn in January. Though still perplexed by his decision to end his life, Dunning said she and Gannon found comfort and some explanations after following up on an open letter submitted to the Idaho Mountain Express by Wendy Norbom on behalf of the Wood River National Alliance on Mental Illness encouraging anyone in such desperate condition to reach out and also informing the public of NAMI's various services for family and friends of people with mental illness. "It saved our lives," Dunning said of attending an educational workshop for families this summer. "We didn't know anything about NAMI and we didn't even know there was a Crisis Hotline here before that." Thrust unwittingly into the category of those whom such groups serve, Dunning was determined to see a way to help the organization that had helped her and her companion so much, but she tread lightly around Gannon's grief and hadn't broached the subject with him. It was only after the family of Olympic aerials skiing star Jaret "Speedy" Peterson appeared on the news speaking out about the issues that led the young athlete to suicide this summer that she advocated the idea of a benefit concert. "I said, 'Let's do it, let's make a difference,'" Dunning recalled. "He said, 'I'm ready, let's do it.'" And so among the four concerts in the series this year, on March 10, international superstar pianists Misha and Cipa Dichter will play to benefit suicide prevention and the understanding of mental illness. Proceeds will go to the Wood River NAMI, the Wood River Valley Crisis Hotline and The Speedy Foundation. "There is so much shame surrounding these issues, and we wanted to be able to make people aware of the resources that are here," she said. "I hope it can bring people together and focus on the cause that is obviously so heartfelt." Norbom, who penned the letter on NAMI's behalf, was grateful to hear how the Gannon family had been reached and thrilled at how it continued to ripple out. "We are honored to celebrate the life of Dex Gannon with his family and are very grateful for their advocacy" she said. "As someone who is personally experiencing the emotions of a recent suicide attempt of a peer, I appreciate this opportunity to be there for those looking for answers. With every seat filled in that auditorium, we will be closer to providing the support our community deserves." The benefit will be held at the Presbyterian Church of the Big Wood in Ketchum. Tickets are $100, $250 and $500 with $60 tax deductible. Dunning said she hopes to make the benefit an annual offering, a little extra hope mixed in with the joy that music brings to people. "I'm really proud of Steve because it's a badge none of us wants to wear, but he has said that he feels he might have been able to save his son's life if he had known more about what was going on with him. He wants to make sure it doesn't happen to someone else." - Info and tickets: www.svartistseries.org starting today and at area bookstores after Dec. 1. - Dec. 20, the Amadea Piano Trio, a holiday concert with the St. Petersburg String Quartet. - Jan. 12, Swedish guitar virtuoso Mattias Jacobsson. 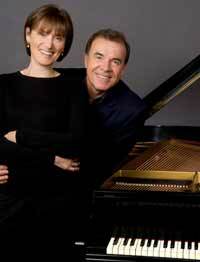 - Feb. 4, St. Louis Symphony Orchestra pianist Peter Henderson with Susan Spelius Dunning in "An Evening of Piano Classics." - March 10, Benefit Concert for suicide prevention with international pianists Misha and Cipa Dichter.